One of my readers has specifically asked about two of the figures in Darwin’s Doubt. I want to directly address those two figures because they are so vital to understanding the misdirection that Meyer has given us. These figures are very important in a number of ways. First, they show how much Meyer has NOT studied the subject. Second, they show just what Meyer’s intention is in representing the material that opposes him. I understand that Meyer presents more information on phylogenetics later on in the book. But that’s not the point here. The point is that Meyer specifically misrepresents the knowledge and practice of science in the field he’s writing about. Here are his two figures, taken from pages 35 and 36 of his book. More significant changes to the form and anatomical structure of organisms would, by the logic of Darwin’s mechanism, require untold millions of years, precisely what seemed unavailable in the case of the Cambrian explosion. As we’ve shown briefly and will continue to show. The fossil record DOES NOT imply that all the various phyla appeared. Indeed, there’s a rich history of fossils and how they change over time. Meyer purposefully (or just does shoddy research) ignores all evidence to the contrary. For example, here I show quite a few of the papers that Meyer does not reference. While the fossil record 100 years ago might have appeared to be like this, it’s really not. Meyer, in figure 2.8, basically combines the graphs, making the same mistakes. He says that the vast majority of the animals haven’t been found, which is a classic god of the gaps argument, even if Meyer doesn’t understand what a god of the gaps argument is. 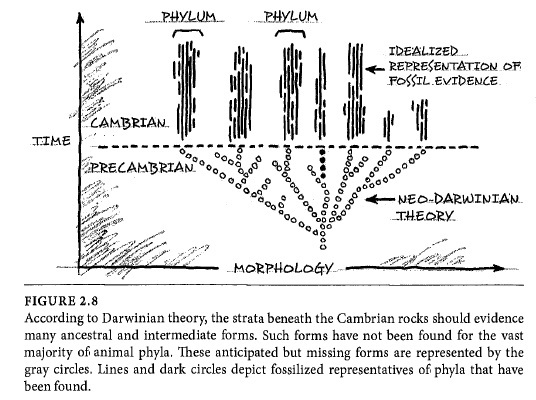 Notice how Meyer has given us a few props by saying that one branch of one group appears in the pre-cambrian. I really hope that Meyer doesn’t want to base his entire argument on this line of (lack of) research. If he does, then he’s already failed. Let’s look at what some actual research done by actual scientists who are actual experts in this field produce. The above diagram is from Peterson 2005. This diagram is based on molecular differences in various genera. The data used was quite extensive. The authors uses data from multiple genes and multiple characters from 32 different groups. This isn’t a ‘just-so’ story. The percentages given in the tree itself are called ‘bootstrap percentages‘. This is a way to evaluate the strength of support for clades on the trees. The number by the node, is the percentage of bootstrap trees which also resolve the clade at the endpoints of that branch. In this case, for a 100% agreement, every single replication (of the 1,000 times the author did this) resulted in the same branching at that point. Notice also, that the branches contain names. For example, deuterostomia is a super-phylum of organisms containing (among millions of other species) humans. This diagram uses characteristics to show how organisms are related. This from Shu, 2006. The is the basics of cladistics. In spite of what creationists believe, an assumption of common descent is not used in the development of these systems. 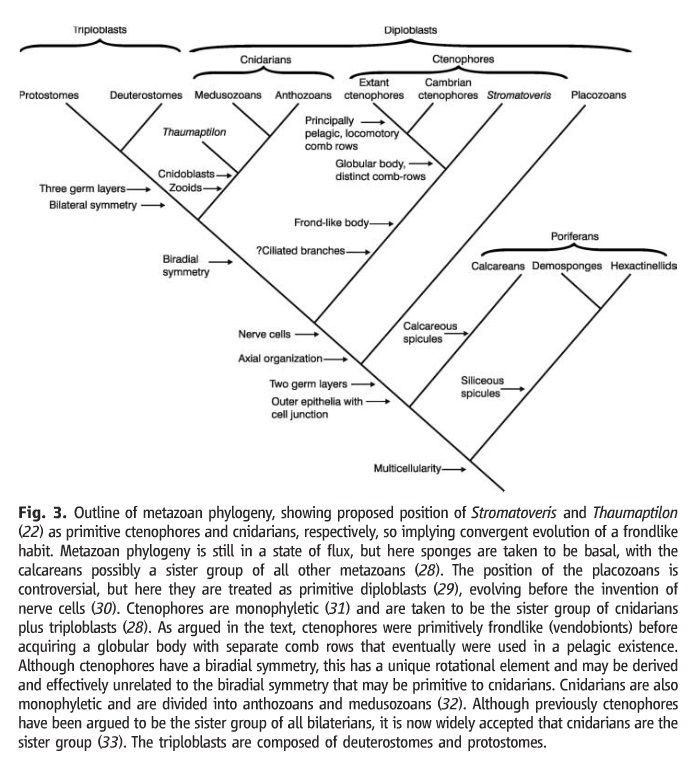 The only assumption is that of parsimony, that is, the cladogram that requires the fewest evolutionary changes is the most likely. That isn’t always the true, but the cases where that claim isn’t true are usually quite obvious. For example, the fact that flight evolved at least four separate times (at a minimum). Here’s one (also from Peterson, 2005) that shows the time of divergence based on molecular clocks. Again, this isn’t s just so story, the authors compared their divergence times to the actual fossil record. They found that the estimates for the molecular clock divergence agreed with the fossil record. These are not isolated examples, the literature is full of these kinds of examples. 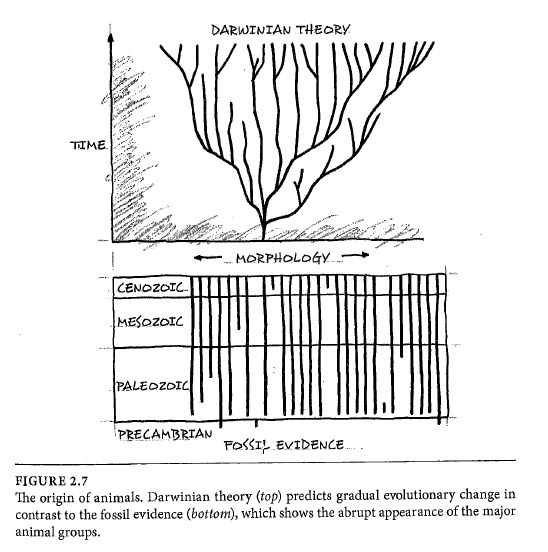 Honestly, there is no place in a book like this (and I’m still not totally sure of the purpose of the book, except to attack evolution) for made up diagrams. Not when there are dozens of diagrams that actually exist made by actual scientists who spent years performing molecular tests, running programs, and then comparing that to the actual events in the fossil record. Meyer’s diagrams are so different than what exists in the literature that they are essentially strawmen. That is, they are totally made up and have no relationship to reality. By attacking them (or using them to show that evolution is wrong), Meyer is just wanking. For an excellent discussion of phylogenetics and how Meyer flubs it completely, please see this EXCELLENT article by Dr. Nick Matzke. Bergström, J, and X Hou. “Arthropod origins”, 2003. Available: http://mzp.cz/ris/ekodisk-new.nsf/1a76d1df1a0e29f0c1256e2800520b9d/9a21746463a798e9c125708f002d7766/$FILE/str.%20323-334.pdf. Budd, Graham . “The earliest fossil record of the animals and its significance.”Philosophical transactions of the Royal Society of London. Series B, Biological sciences, 26 Apr. 2008. Available: http://www.ncbi.nlm.nih.gov/pubmed/18192192. Peterson, K, M McPeek, and D Evans. “Tempo and mode of early animal evolution: inferences from rocks, Hox, and molecular clocks”, 2005. Available: http://www.psjournals.org/doi/abs/10.1666/0094-8373(2005)031%5B0036%3ATAMOEA%5D2.0.CO%3B2. Shu, D-G et al. “Lower Cambrian vendobionts from China and early diploblast evolution.” Science (New York, N.Y.), 4 May. 2006. Available: http://www.sciencemag.org/cgi/pmidlookup?view=long&pmid=16675697. Sperling, E. A., D. Pisani, and K. J. Peterson. “Poriferan paraphyly and its implications for Precambrian palaeobiology.” Geological Society, London, Special Publications, 2007. Available: http://dx.doi.org/10.1144/sp286.25. An argument I’ve discovered that shuts up wanabees. 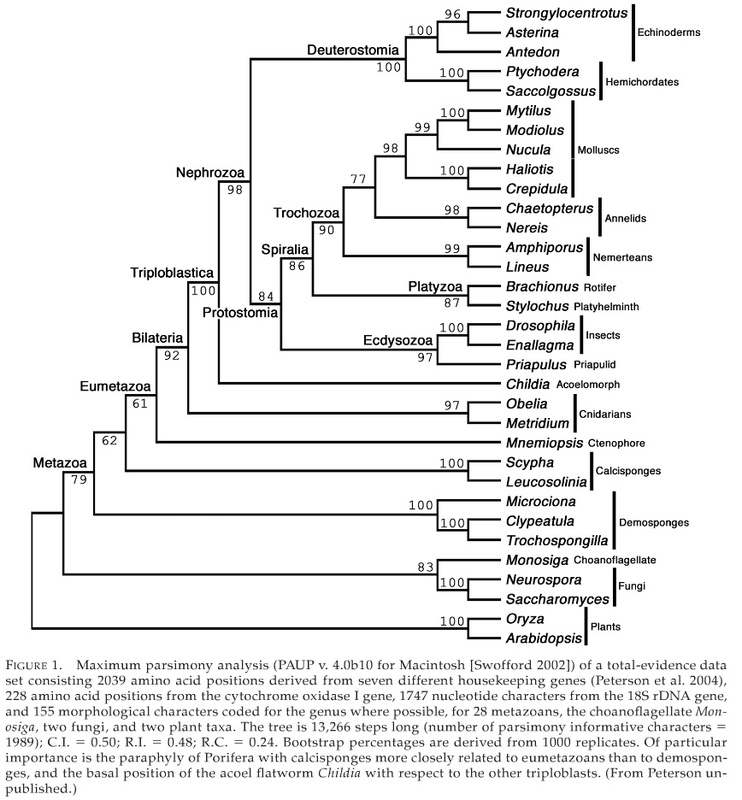 They claim that Meyer shows that different phylogenies produce slightly different trees, ergo all trees are wrong and there’s evidence for common descent. I point out that it’s just like the issues with the New Testament — the four gospels produce slightly (but significantly contradictory) accounts of Jesus’s life, ergo they are all wrong and there’s no evidence that Jesus ever existed. We know nothing of the life of Jesus from when he was born until when he was 30, and that was only 2000 years ago. Note: this is in no way to bash believers, and I’m very much on the side of a number of theistic evolutionists. It’s just a fun analogy that cuts home. I always ask if they can trace their personal lineage all the way back to Noah or Adam. If not, THEN HOW CAN YOU EXIST!?!?!?!? ZOMG!>>! I actually did ask that! Then I thought of the issue of those missing 30 years. plus: if a self replicate car cant evolve into an airplan, how can a bacteria can evolve into human ? the evolution say that small steps for milions years become a big steps. but according to this a lots of small steps in self replicat car (with dna) will evolve into a airplan. Linking to creationism websites does not actually enhance your unsubstantiated claims. Really? This is your argument? A claim that has been debunked for over 100 years and you think that this is a devastating argument. You need to learn what evolution actually claims before promoting strawmen arguments and then not being able to defeat them. I understand that these are difficult concepts and if you’d like some help understanding them, please let me know. But nothing you have said is evidence for design… nor intelligence for that matter. Gil, I’m going to take the charitable view and assume that English is not your first language (or your second, for that matter) but can you try again and explain what you mean by “a self replicat watch” and especially a “self replicat car (with dna)”? Human designs frequently build on previous designs (the Wright brothers’ planes built on previous gliders, automobile engines, ship propellers, etc. There is, in fact, a way that car designs can “evolve” into airplane designs. But the designs of an omnipotent, omnicient designer would not need such trial and error. If you are arguing for trial and error design, you are excluding God as the designer, at least as Christians and many other theists conceive of him. And, of course, if you are asserting that human design is identical to evolutionary theory, you are simply engaged in “begging the question” by assuming your premise in your conclusion, a logical fallacy. i again john. i mean that if somone will creat a self replicat c ar or watch. is that kind od watch will be an evidence for design? It will be evidence for an intelligently designed watch. That’s all. “That is (Meyer’s Figures), they are totally made up and have no relationship to reality. But they are made up in such a cleverly sneaky way. Take the example given of Figure 2.7. A hypothetical branching tree versus the straight lines of “the fossil evidence”. Of course fossil evidence shows those straight lines. Because the fossils themselves cannot show interrelationships: those lines show the duration in the record of various taxa. The relationships have to be inferred from human study —- which Meyer could paint as subjective and meaningless (which he tries to do with his trashing of phylogenetic analysis). But think about it: how could dead things in the geological column show, by themselves with no interpretation, a branching tree? The really really annoying thing about Meyer is that he doesn’t actually lie —- he just distorts and repackages the truth to make it look as if the scientific evidence supports him. I am reading Don Protero’s Evolution: What the Fossils Say and Why It Matters at the moment, so I may have some difficulty sorting out what he has said from what you have. Actually, it wasn’t the logic of Darwin’s mechanism, it was Darwin’s predisposition. Huxley saw that immediately and warned Darwin “You have loaded yourself with an unnecessary difficulty in adopting Natura non facit saltum [Nature does not make leaps] so unreservedly.” Of course, in geologic terms, “leaps” may be tens or hundreds of thousands of years. From there, it’s on to allopatric speciation, Punctuated Equilibria, and many quote mines used by creationists, that actually disprove that it was the “logic” of Darwin’s mechanism. I’m sorry if I’m repeating what you’ve said before but one result of living as long as I have is a swiss cheese memory. Not to mention failing to note that I mispelled Prothero’s name. I’m not an expert in this stuff, so maybe I’m missing something, but your first figure, “figure 1”, reading the caption, it seems this was built from DNA comparisons of living organisms. Where are the FOSSILS? Your second figure, “figure 3”, reading the caption, it seems to be someone’s best categorization of, again, living organisms. This figure is particularly fraught with guesswork, from what I’ve read in the figure (“implying”, “state of flux”, “taken to be”, “possibly”, “controversial”, etc. ), which makes me wonder how useful this figure is. Again, where are the FOSSILS? 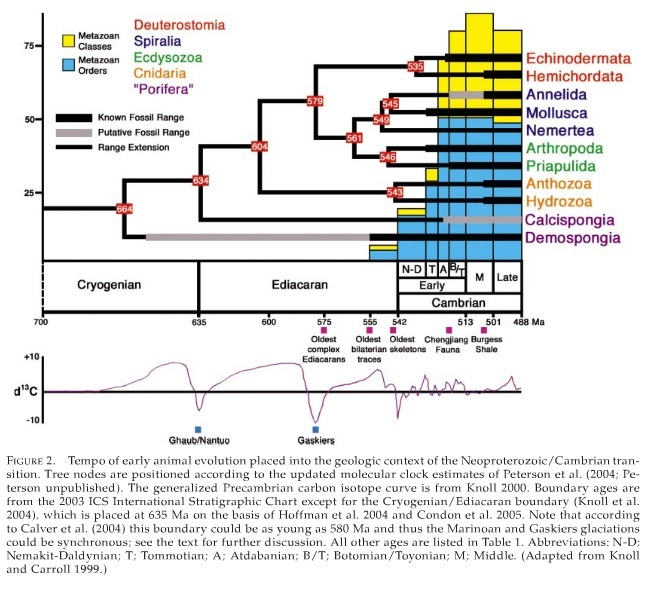 Your third figure, “figure 2”, shows the actual discovered ranges of fossils, and this pretty much aligns with Meyer’s two figures you posted. All the connecting parts are “range extensions” that have not been shown to actually exist, which is Meyer’s point: there is no fossil evidence. Smilodon, if Meyer is fundamentally wrong with these graphs, you haven’t given any evidence to show this. I think Meyer’s figures are particularly illustrative of what the state of the fossils actually shows, minus all the interpretive gloss to cover it up. You need to first see the actual evidence clearly before proposing solutions (the next chapter and onward in the book). “He says that the vast majority of the animals haven’t been found, which is a classic god of the gaps argument, even if Meyer doesn’t understand what a god of the gaps argument is.” I do not think that phrase means what you think it means. A god of the gaps argument is an argument from ignorance. Simply pointing out that the vast majority of purported organisms left no record does not make an argument, let alone an argument from ignorance. On page 40, Meyer writes, “The actual pattern in the fossil record, however, contradicts this expectation [of gradual change]. Instead of more and more species eventually leading to more genera, leading to more families, orders, classes, and phyla, the fossil record shows representatives of separate phyla appearing first followed by lower-level diversification on those basic themes.” In other words, as more fossils are discovered, those “gaps” in the graph of morphological distance are becoming clearer, not blurred as would be expected. In other words, at this point, it’s highly unlikely that any will be found; it’s highly likely that the picture we have of discrete, disconnected phyla is the correct one. Thanks for continuing on in this series. Obviously, you can’t get DNA from fossils. What the DNA does do if provide a prediction of what we would expect from the fossils… or a confirmation of what the fossils do show. Unless and until, Meyer shows that all those things are wrong. Then he can ‘interpret’ them all he wants. He’s still wrong. As far as tentative, that’s what science is. It’s tentative. Anyone who expects to find a completely unbroken sequence of fossils from the first organism to present is a fool… or a creationist trying to confuse you. I have explained previously why Meyer is wrong on this. You can read my work and the references there in. You can read Matzke’s comments.. who, BTW, actually is a phylogenticist. Oh and Meyer fundamentally misrepresents the fossil record as well. But I’ve already said that half a dozen times as well. If you don’t get it, then you don’t get. But don’t pretend it’s because you were never told about it. No, they are completely different. Meyer’s figure 2 is labelled “Morphology” along the x-axis, but he did not compute any morphological distances; he set them to zero, because creationist religious BELIEF requires no change in Biblical “kind”, and he falsely presented his religious hypothesis as DATA, which is scientific fraud. By contrast, Figure 2 y-axis above does not represent MORPHOLOGICAL changes, it’s a phylogenetic diagram showing branching from common descent. Meyer did not observe, compute nor record any data for his figures 2.7 and 2.8. See, Buho regards the crucial, important point being the zero morphological change shown by Meyer’s falsified “data” in his fake plot. So Buho got the memo and parrots the party line. Guess what? Meyer did not compute morphological changes. He plotted “data” and “evidence” that he, Paul Chien and Casey Luskin invented. It’s scientific fraud. Smilodon, thanks for this. I’m wondering if I’m the reader who mentioned who asked you about those two figures? Because I felt they were crucial to Meyer’s hoax. How did you get those scans of those figures? They’re atrocious. I’m guessing you didn’t redraw them by hand, but they certainly look amateurish. Did you scan them from the print edition or copy them from the Kindle edition? 1. The x-axis is labelled “morphology” so they can trick their church audiences there have been zero morphological changes in each phylum, e.g. zero morphological change between a jawless chordate and a blue whale or a vampire bat or Homo sapiens. The “morphology” values are simply invented– it’s fraud. 2. They label these plots as “data”, “fossils” and “evidence” although it’s really a plot of their religious hypotheses, wishes and dreams. Design and Public Education (2004) [http://web.archive.org/web/20040625213207/http://www.discovery.org/scripts/viewDB/filesDB-download.php?id=29]. Although this article appeared in the 2004 book, the article itself first appeared 2001 as far as I know, that’s 13 years ago. their “data” changes not a whit– because it was never based on data. Meyer, Ross, Nelson and Chien 2001 say the pitchfork plot was drawn by Art Battson; he may be the ultimate source. The fake pitchfork plot appeared in “Of Pandas and People” (1997?) and is cited and dissected by Kevin Padian in his Dover v. Kitzmiller testimony here: http://www.sciohost.org/ncse/kvd/Padian/Padian_transcript.html. Casey Luskin in 2004 not only copies the pitchfork plot hoax, but he has the gall to cite his source data as a popular book by Niles Eldredge! I got the Eldredge book and looked up Luskin’s citation– of course he says no such thing and presents none of the fake “data” hoaxed up by Luskin and the IDers. In fact, in Luskin’s cited page, Eldredge says some species are intermediate between phyla (e.g. onychophorans), which contradicts the pitchfork plot itself! A pathetic Luskin lie, see it here: http://www.ideacenter.org/contentmgr/showdetails.php/id/1232. 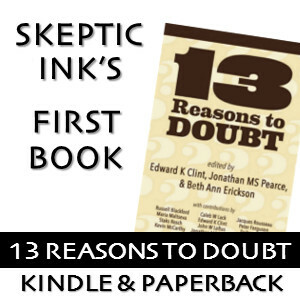 The original was probably drawn by Art Battson; see his pages on Christian apologetics, which have perhaps the first versions of the pitchfork plot hoax: http://www.veritas-ucsb.org/library/. Thanks. I have the Kindle Edition and someone was kind enough to scan and OCR the book for me as well. So I have a set of excellent PDFs to copy the diagrams from. That’s one of the first things I noticed in this book, that is, the diagrams seem like hand drawn (on crummy paper with a shaky hand) concept art that just wasn’t completed. I sure as heck wouldn’t use anything like that in a book I was writing (and I’m not). I have used crude drawings like this for work in the past, but only for a general conceptual framework, certainly not for the truth of the matter. Hey good buddy, wouldja mind emailing that PDF to (my name) at gmail.com, no spaces? I’m a collector of creationist books, and I plan to share my large collection of PDF’s with NCSE via google docs, and I’d be obliged.